Photobooths are the latest craze at weddings, and are springing up everywhere! Get your guests in the spotlight and capture a unique memory of your wedding reception, staff Christmas party, family reunion, corporate event, or other special occasion! Forget squeezing into a tiny box. We will provide a 12×12 foot portable photo studio – complete with your choice of backdrop, lighting, props, and real live photographer! You and your guests will be able to freely access and download your favorites from an online gallery soon after the event. Great for staff parties and community events! The preferred choice for weddings! Additional time is available for $200/hour. On a tight budget? Rent our backdrop and props, and provide your own photographer! Ask about the various DIY options available. To see the fun in action, visit Partybooth by Copperblue Design on Facebook! I can’t wait to hear from you! Please use the form below to get in touch! 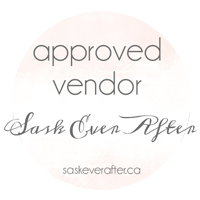 Copperblue Photography & Design is based in Saskatoon, SK.